Let us replace your old garage door. If your garage door is damaged or otherwise needs to be replaced, a new garage door from Sears is the answer. 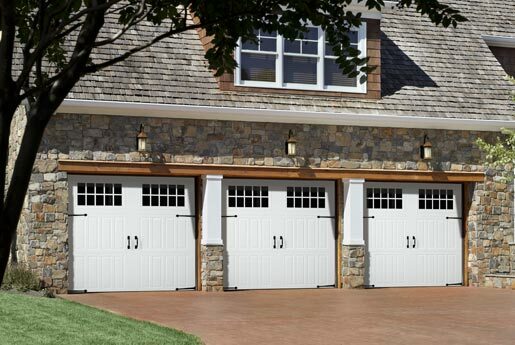 Choose between a traditional garage door style or a carriage style garage door. 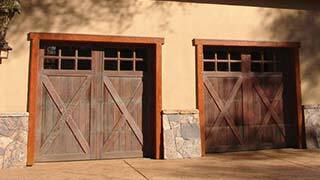 Traditional doors are steel; carriage doors are available in steel or wood. 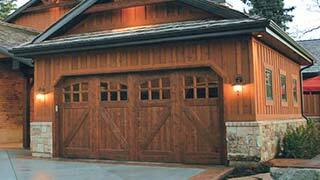 For steel garage doors, choose among single, double, or triple-layer construction. 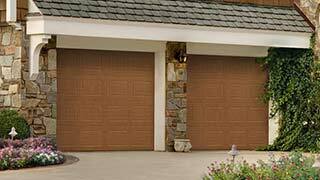 Sears steel garage doors are available in 11 colors, including three with a woodgrain finish. Give your new garage door a custom look with optional windows and decorative hardware. There’s a Sears garage door to fit everyone’s budget. In-home estimates are free, and special financing is available. You can also visit our blog and read our garage door buying guide to learn more about selecting a garage door. Garage door opener replacement and installation can also be done through Sears. Learn more about garage door opener installation and Craftsman garage door openers to complete your garage. Timeless beauty and old-world style with the latest modern technology. Reliable steel door with the appeal of a premier carriage house door look. 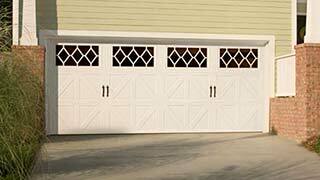 Look like authentic swinging stable doors but are made of steel and move like a regular garage door. Single, double, or triple layer construction that can be enhanced with decorative hardware and windows.